Object's material primary 'Color' properties can be changed on the 'Material' context ribbon category. To change the basic color of an object, simply click the large paint can in the 'Appearance' section of the 'Material' context ribbon to display a selection of colors. If you would also like the object to appear semi-transparent, the 2nd of these icons allows you to choose what's called its Alpha level. The material is given a single color. The material is graduated between 2 colors in a straight line fashion. The material is graduated radiating from the 'Main Color' at its center out to the 'Color 2'. 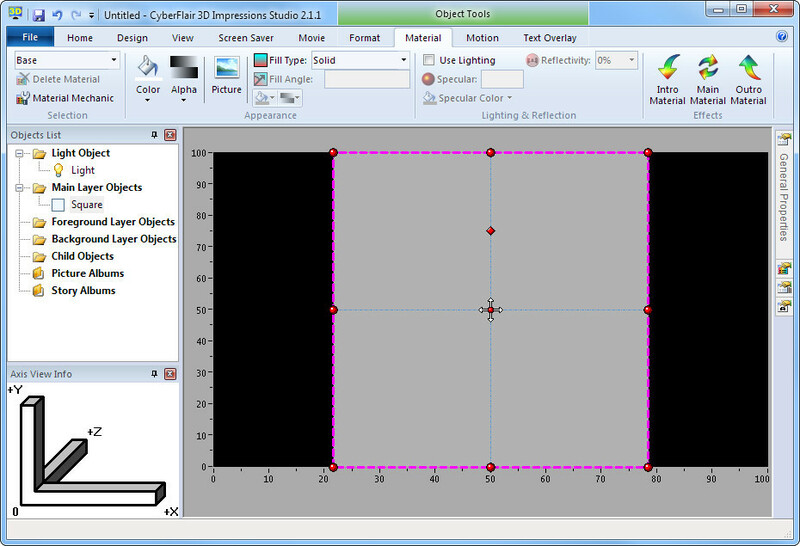 To use a gradient fill, use the 'Fill Type' selection property on the Material Ribbon or Material Properties window. Selecting a non-solid fill type allows you to specify 'Color 2' and its associated Alpha value. For a Linear gradient, you can also specify the direction the color change follows. This is done by specifying the 'Fill Angle'. Try experimenting with different values and then clicking the Preview button.